In part one of his series of three articles about deep transformational currents, Markku Allison, the founder of Scan, a strategy, culture, and design consulting firm, explores the first of the currents: complexity in systems, organizations, and the workplace. Read his introduction to the series here. 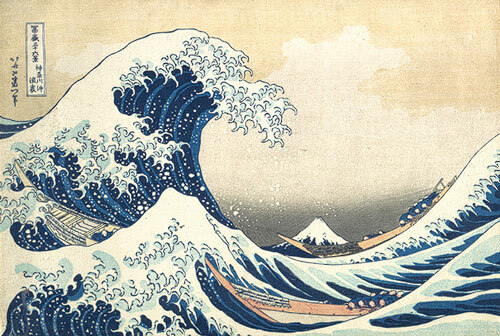 The Great Wave at Kanagawa (from a Series of Thirty-Six Views of Mount Fuji) by Katsushika Hokusai. Everything is connected. Small changes ripple across systems with unintended consequences. Decisions have long-reaching implications that may not be understood, both on solutions and the parties involved. But we can handle it! New models for organization and management allow for greater understanding and flexibility. Think of this: suppose you have four decisions to make. You can connect those decisions in six possible ways, and arrange them in 64 possible patterns. If we bump it up just a little, say, to 10 decisions, things change: you can connect those ten decisions in 45 possible ways, but you can arrange them in over 3,500,000 possible patterns. Over 3.5 million! If the sequence of decisions has meaning, that small change in quantity has huge implications in possible outcomes. That’s just the tiniest glimpse into the world of complexity. “Decisions diagram” courtesy of Marrku Allison. There was a point in time where our projects were relatively simple in terms of the number and type of decisions we needed to make. This was true of pretty much all human endeavors, but looking specifically at the AEC space, our materials were limited, structural systems not very sophisticated, mechanical and electrical systems non-existent, etc. This made projects pretty easy to manage: we knew what we knew and also knew what we didn’t know, swiftly resolving conflicts and problems by making an appropriately arranged series of decisions. Let’s call this the age of simple systems, where things were known: the relationship between cause and effect was obvious to all. Decisions had expected outcomes. We could manage work with techniques like a simple checklist. Over time, our projects became a bit more challenging. We started to employ a broader range of materials, better understanding their interactions; structural systems became more sophisticated, simple mechanical and electrical systems were introduced. Projects were more challenging to manage: we knew what we knew, and through analysis, could discover and know what we didn’t know, responding accordingly. An era of complicated systems in which things were knowable: the relationship between cause and effect required analysis or some other form of investigation and/or the application of expert knowledge. Decisions were layered on decisions, but we got to where we wanted to go, predictably. Work was controlled using tools like Gantt charts or, later, critical path method. Over time, our projects became a bit more challenging. We started to employ a broader range of materials, better understanding their interactions; structural systems became more sophisticated, simple mechanical and electrical systems were introduced. I suggest our stay in this time of complicatedness was brief. Our projects swiftly transitioned into complexity. Again looking at the AEC space, the range of material choices expanded exponentially, as did the possible interactions between them. Structures became increasingly difficult to analyze, especially as our knowledge of seismic and other less predictable forces grew. Mechanical, electrical, plumbing, security, acoustical — these systems utilize hundreds of parts, with decisions about one part of one system having impact on other parts of other systems, which in turn affected other parts of other systems, and so on. Experts emerged as specialists in each of these systems, with boundaries of responsibility drawn between them. Decisions in one area then could easily ripple across a boundary and have a significant impact on someone else’s area of responsibility. We have long tried to manage today’s work using tools suited for complicated work, but we fail on a regular basis: industry research tells us at least 30 percent of projects are behind schedule and over budget. 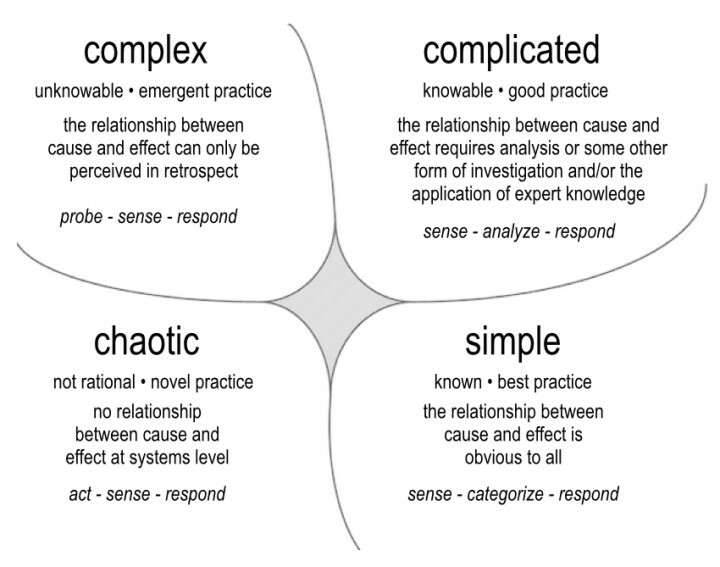 Dave Snowden’s Cynefin Framework does a great job illustrating distinctions between simple, complicated, and complex. So what are characteristics of complex systems? They have many, many moving parts, and connections exist between those parts, some known, some not known. Small changes in a complex system can ripple across both understood and less understood connections and create outcomes and changes that were completely unexpected. Our actions themselves are part of the complex system: simply by interacting with a complex system we can change its dynamic and ultimately its effectiveness. We can poke the system and observe its reaction, and then manage toward desired outcomes, but complex systems are inherently resistant to tight-fisted control. Why does any of this matter? Projects in the workplace in general and in AEC in particular are ultimately about decisions: all completed projects are records of a series of decisions made over time. Most projects require dozens or hundreds or thousands of decisions, and they are usually made by not one but by many people, sometimes in concert but many times not. If on a project the decision I make has an impact on the decisions you might make (and they almost always do), if somehow we don’t work in a way that makes those impacts explicit and visible, we are likely to run into unexpected outcomes. Herein lies the challenge, and the opportunity. We have long tried to manage today’s work using tools suited for complicated work, but we fail on a regular basis: industry research tells us at least 30 percent of projects are behind schedule and over budget. Complexity is pervasive in today’s workplace, but our understanding of it is not. Think of the structure of your organization, or of a recent project you worked on. Think of one major decision. Think of the supporting decisions that led to that decision, and the decisions that will flow from it now that it’s made. Draw a diagram of all the individuals who contributed to the decision, its supporting decisions, or ones to follow, and how they are connected to one another. Layer on groupings like departments, trades, disciplines, or teams, and consider the additional impact on decisions from that angle — where are lines of responsibility drawn, boundaries between “this is my job/decision” and “this is your job/decision”. It will quickly become a spaghetti diagram with no clear logic or flow — yet somehow we muddle through, and work gets done. It just doesn’t usually happen in the way we thought it would, or at least not as much like we’d like to expect. Looking back at the idea of deep transformational currents as tsunamis, this deep current of complexity manifests itself in the workplace as extended schedules and missed deadline, unmet expectations, blown budgets, dropped balls, mixed, missing, or garbled messages, work that is redundant or at cross purposes… the list goes on. Symptoms, not causes. A cross-organizational diagram illustrating connections between departments, teams, projects, project leads, project participants, and interested individuals. Image by Markku Allison. However, if we take steps to make the complexity inherent in our organizations and projects explicit, we can start to see how we might address these kinds of problems. We can introduce ways of thinking about teams as networks. We can use tools and methodologies that make connections between decisions — and decision makers — visual and visible. These steps may seem simple on the surface but when effectively deployed in a workplace can have profound impact on the organization’s ability to see a bigger picture, and our projects and organizations — and decisions — can become better informed. A project visualized as a network of participants. Image by Markku Allison. But simply exposing complexity isn’t enough: dealing with complex challenges requires a whole new approach. We already know from experience that tools that worked for complicated problems aren’t flexible or agile enough for complex problem solving. Neither are cultures rooted in those tools and techniques, which is to say most cultures. Next up, in part two: how collaborative culture supports complex problem solving.